It was an uncanny coincidence that just as I was reading about nostalgia, I found myself going home. I mentioned The Hare with Amber Eyes in my previous post, but shall reiterate here quite how brilliant it is. Really, buy a copy and read it. But the life of objects within the Palais was less mobile. The world had undergone an Umsturz, an overturning, and this led to a kind of heaviness in the things that made up their lives. Things now had to be preserved, sometimes even cherished, where before they had been just a background, a gilt-and-varnish blur to a busy social life. The uncounted and the unmeasured started at last to be counted very accurately. There was a huge falling away; things were so much better and fuller before. Perhaps this was when there were the very first intimations of nostalgia … Viktor and Emmy kept everything – all these possessions, all these drawers full of things, these walls full of pictures – but they lost their sense of a future of manifold possibilities. This was how they were diminished. Vienna is sticky with nostalgia. It has breached the heavy oak door of their house. Nostalgia etymologically means the pain of homecoming, from the Greek nostos (homecoming) and algos (pain), coined in 1688 as a translation of the German heimweh. Its meaning only shifted to take on its more current sense of wistfulness for the past in 1920 – just as the Ephrussis were entering their predicament. How particularly apt that de Waal invokes this sense of nostalgia so poetically, when it has just come into being. My own nostalgia over the past couple of days should be more linked to its etymological sense – I went home and it was painful! But no, the pain was more to do with being lurgied and coughing and spluttering and sneezing everywhere, rather than a trauma of coming home. In fact it was heaven to go home, to a big clean house, to a fridge full of M&S treats and a mother who was convinced that I was really terribly ill and must go and get some antibiotics. Masses of sympathy and masses of sleep – a winning combination. But I did find the objects at home had taken on a wistfulness. Of course, my old bedroom has changed since I was its full-time occupant. Shelves have been cleared, cupboards emptied; a new bed has been put in, with new linen; a whole stack of bookshelves turned into a flat-screen TV. But there are a few survivors. Old cuddly toys in a row up at the top of the shelves, all my children’s books, lined up series by series – Swallows and Amazons, Duncton Wood, the Lord of the Rings, Redwall, Tintin, Asterix, Barbar, Beatrix Potter … as well as the occasional piece of detritus that has accumulated from visits over the years. A post-it note about keys, an old receipt, a half-consumed packet of chewing gum. Useless bits and pieces that the cleaner is too nervous to throw away, just in case they might hold some hidden resonance. Yes I really should throw away that old post-it note and definitely the chewing gum – it’s probably not even all that chewy anymore – but there’s something about the way everything is preserved, as though in amber. On a minute scale, it’s a bit like Rodinsky’s Room, in which Rachael Lichenstein and Iain Sinclair describe a fetishised lost room off Brick Lane, untouched for eighty years, discovered as though its occupant had just left – a bowl of porridge still sitting on the desk, now with a thick layer of dust on top. It is an effort to bring these objects up-to-date, into the present, to push them towards a future. It is too tempting to leave them be, redolent of that moment in the past, sticky with nostalgia. I wonder if I’ll feel nostalgic. But yesterday, as I entered Haggerston Station, excitedly about to embark on one of the new London Overground’s virgin journeys, I also felt like I was in a foreign country. And I was stepping into the future, not the past. Balloons arched over the station entrance to celebrate the line’s official opening. The ticket man was giving out free one-day travelcards, complete with a small chit of card stating: ‘Issued to mark the opening of the new London Overground line between Dalston Junction and West Croydon on 23rd May 2010’. Cool train-geek memorabilia. The station itself was spacious, clean, other-worldly. Perhaps it did feel slightly brutal, slightly communist, but then perhaps that’s appropriate – bringing transport to the masses seems like quite a utopian, communist idea. And then, instead of getting escalators down into the smelly netherworld of London, we walked up the stairs, out into brilliant sunlight above. The platform is the perfect spot for a bit of voyeuristic snooping. While waiting for the train – which was remarkably unBritishly punctual – we had a brief chance to peek at nearby residents’ balconies, and peer through huge glass windows into a few snazzy flats. The trains themselves are beautiful. Instead of being spliced into carriages, they are single long vessels, wonderfully wide, and air-conditioned. It’s the first time I’ve ever put on an extra layer of clothes on the tube. It was clean, spacious, and the doors beeped rather dramatically when closing. The whole experience was so foreign, so new, so much better than the rest of the tube. I knew we weren’t in Tokyo, however, because of the familiar tube maps glued on to the edges, the robotic voice announcing (in English) that the next station is Hoxton and the seats, which look markedly similar to the ones that were on the old District Line. And then the train took off – it really feels like flying. It hurtles through the skyline, charging across the Regent’s Canal, bending, curving gracefully between tall converted warehouses and new-build apartment blocks. And this is the true piece of disorientating magic. Here is London, laid out at one’s feet, here are the landmarks that one knows and loves, here are the crowds of people swarming along Brick Lane, and buses, and cars, and trees. The train flies through the city showing one all these things, these places that are absolutely, resolutely, fundamentally London. And yet this new view, this new route is almost enough to make it somewhere else entirely. It is eye-opening, fascinating, thrilling, to fly through East London on this new trajectory, linking places together in ways that can’t be done by road. In fact, I was so intrigued as to where the railway actually went, which roads it crossed over, where exactly it curved, that when I got back to my laptop I looked on Google and Bing maps to trace the precise route. And that’s when I really felt I’d been in the future, or a foreign country. The internet maps, of course, are photographic. But they’re not particularly up-to-date. The new trainline isn’t yet on them. According to these maps, the London Overground doesn’t yet exist. So I can only conclude that yesterday I really was in the future, in a foreign country. And, mulling over L.P Hartley’s words as I went between Haggerston and Canada Water, I was proud and impressed and happy to find that yes, they do things differently there. I met someone at a dinner party the other day and it transpired that we both wrote blogs. ‘What’s yours about?’ she asked. ‘Oh, it’s about books. And about me,’ I said, worrying that I wasn’t making it sound all that great. But how can you possibly find anything interesting to say about plumbing? I wanted to ask, but managed to stop myself. I began to see it as a challenge; I wondered if I’d be able to write a post about plumbing. I spent the rest of the dinner party racking my brains to think of any books about plumbing. But unblocking drains is not the most literary of pursuits, and I drew a complete blank. And what about Shame by Salman Rushdie? But, obviously, none of them is actually about plumbing. Missed opportunities? I wonder what a novel about plumbing would actually be like. Or it could be a crime novel. Meet Pete Sinker. He’s a plumber. And a psychopath. How about Bob Snatcher, who bludgeons his victims to death with a sink plunger and spanner? Or Sam Yanks, the serial killer who finds his victims with an ad in the Yellow Pages, in which he poses as a plumber. I suppose it could be chick lit. A sad single woman finds love when a dark handsome man comes to fix her bath. She’s too nervous to ask him out, so she keeps breaking things – sinks, dishwashers, washing machines etc – so that she can see him again. Then, of course, they realise they both love each other and live happily ever after. Or, more alternative, there’s an old Polish cleaner in a very smart house, who accidently breaks the washing machine. She calls a plumber, begging him to be as quick as possible – it’s an emergency, if the mistress of the house finds out, she’ll get the sack. The plumber arrives and turns out to be from the same village in Poland/her long lost brother/her husband who she thought had been killed. There are some good in-jokes. They reminisce about when they first got running water in the village and their favourite type of cabbage, and laugh in the afternoon light. Now I come to think of it, the possibilities are endless. Maybe one day I will come across The Heart-broken Washing Machine or A Short History of Sinks in Polish or Pete Sinker Plunges Again. And when people look sceptical and say, ‘How can there possibly be an interesting book about plumbing?’, I will direct them to this post and hope they will see what fertile stuff lies dormant in the U-bend. A rather embarrassing omission was pointed out in my Top Ten London Books … Iain Sinclair. In my defence, I was going to include the brilliant and fascinating Rodinsky’s Room, which he wrote with Rachel Lichtenstein, but thought that, alongside Litvinoff, two Jewish East London non-fictions would be a bit much. 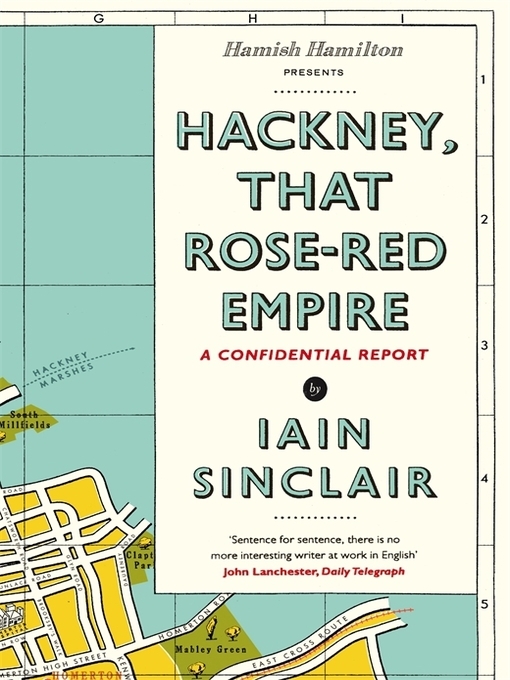 The Iain Sinclair book that’s all the rage at the moment is Hackney, That Rose-Red Empire, just out in paperback. I was lucky enough to hear Sinclair talk last week in part of a spate of paperback-publication-prompted events. He’s a fantastic speaker – engaging, intelligent, somehow managing to ramble along digressions yet remain focussed on an overarching argument – but what really shone out at me from a wealth of inspiration was his use of the word ‘panorama’. Cream corridors broad enough to push two gurneys in opposite directions, a Mondrian grid of window-panel reflections. And everywhere, at every turn as you climbed the stairs: views … Emerging on to the flat roof, I was dazzled by the verdant spread of Hackney, its railways and churches. The hospital is somewhere that offers a panorama, a place where there are ‘views’, where one can see ‘the verdant spread’ of the landscape. It is clear that, for Sinclair, knowing where one stands in the wider landscape, how one fits into local geography is vital. A blood meadow: London Fields. Public ground for the fattening of herds and flocks, Norfolk geese, before they are driven, by very particular routes to Smithfield slaughter. Sinclair is prone to using the present tense for descriptions, bringing a space’s previous incarnation into the immediate moment. London Fields is transformed from a park to its earlier existence as a place for animals to graze on their way from countryside to Smithfield abattoir. Historical and geographical panoramas are combined as Sinclair shows this old use of London Fields to be linked to its position en route to Smithfield. Panorama – what does this tongue-rolling delight of a word really mean? 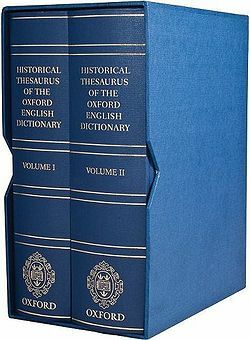 I looked it up in my weighty, wonderful copy of The Historical Thesaurus of the Oxford English Dictionary (worth every penny of the cripplingly-expensive price) and alighted upon various uses. First, the obvious interpretation, still employed today: from 1801, ‘panorama’ has meant a ‘comprehensive survey’, expanding in 1828 to mean a ‘general … extensive view’. Yes, this is what Sinclair is talking about, seeing extensively, comprehensively, an overview. But what about from 1709 to 1899, when the word was used to describe a ‘moving picture’, a specific type of ‘optical show’? An echo of this, now defunct, meaning reverberates around Sinclair’s text. Yes, Sinclair is seminally involved in Hackney’s community, but the way in which he describes the life, the past lives, of the borough, the documentary nature of his fic-faction, puts Hackney on show. Sinclair aestheticises Hackney, entertaining the reader with his ‘optical show’, his carefully-crafted picture, which moves at his walking pace. The final sense of panorama, an ‘optical illusion … of a passing scene’ (in use from 1813), is the most disruptive. It points out the fiction, the falseness, the leap of faith, in Sinclair’s prose. For London Fields isn’t a ‘blood meadow’, there are no gurneys being propelled down the corridors of the old German hospital; his deft prose, loaded with historical resonance, creates an illusion. The past has gone, but Sinclair manages to momentarily recreate a ‘passing scene’ from it, by yoking it to the present. But the resulting panorama is no more than optical illusion, tugging at the unreal seams of what has been fabricated. Perhaps this is why Sinclair’s prose is so often criticised as being too dense, too treacley to wade through. Every word is loaded with resonance – literary, historical, geographical – in an attempt to bring panorama to every description, every place. I am enchanted by his prose, wanting to believe in the illusion of a present-past-here-there synthesis of a moment, but, at the same time, the now is too real to allow the illusion to remain intact. I can’t find a single poem that touches on the future. Everything is resolutely nudged by the now, under the drag of an invented past. I’m sorry, Harriet, I have no idea what the future holds. Or what it is… In Hackney we must train ourselves to exorcize the future. Sinclair’s historical panorama is one-way, linking present with past, rather than with what lies ahead. The current experience, in reality, is all fence; the fence is the sum of our knowledge of this privileged mud. Visit it as early as you like, first light, and there will be no unsightly tags, no slogans, a viscous slither of blue: like disinfectant running down the slopes of a silver urinal trough. The passage of the fence painters is endless, day after day, around the entire circuit, repairing damage, covering up protests. Trails of sticky blue drip into grass verges, painterly signatures: the plywood surface never quite dries, subtle differences of shade and texture darken into free-floating Franz Kline blocks. All that people can see of the Olympics is the blue fence, so the fence is where they protest, and, in this sterilised zone, the protests are erased, painted over, denied a place on the landscape. The blue fence, with its endless cycle of repainting, prevents the ‘moving scene’ of panorama. One of Sinclair’s great objections to it is that it prevents walking, interrupts routes through the landscape, ‘suddenly there are places where you can’t walk freely’. It is an immobile block, breaking up the geography, endlessly present, unable to be yoked to any other moment in time. How can Sinclair look ahead to Hackney’s future, when all that can be seen is this homogenising screen of fakery, an ugly blot of enclosure, separation, naïve and arrogant resistance to any continuity of time or place?